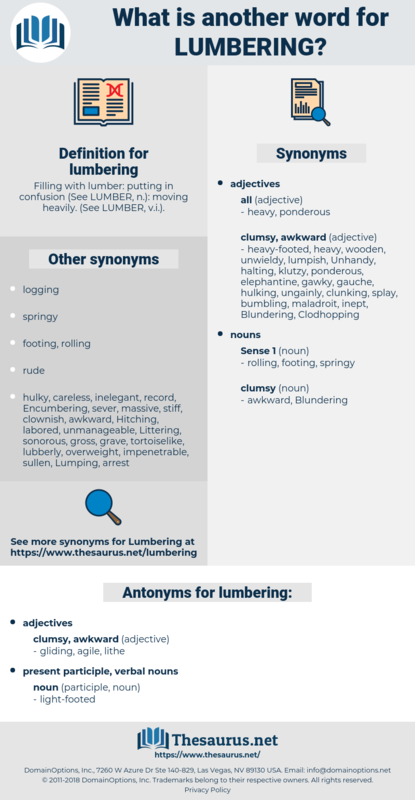 What is another word for lumbering? 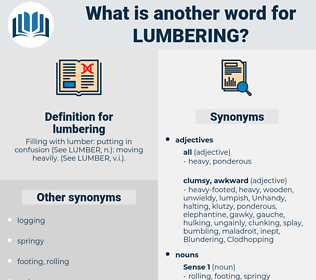 Filling with lumber: putting in confusion ( See LUMBER, n.): moving heavily. ( See LUMBER, v. i.). Were there bears in the woods, and at nightfall would they come lumbering out, and, pushing the door open, squeeze her and Gentilla to death in a mighty bear hug? And so it goes on hour after hour till at long last there is a spurt or two of fire and the crackling of blank, a lumbering charge, and then much gathering together of platoons and companies, and we have learnt our lesson and may go to bed.